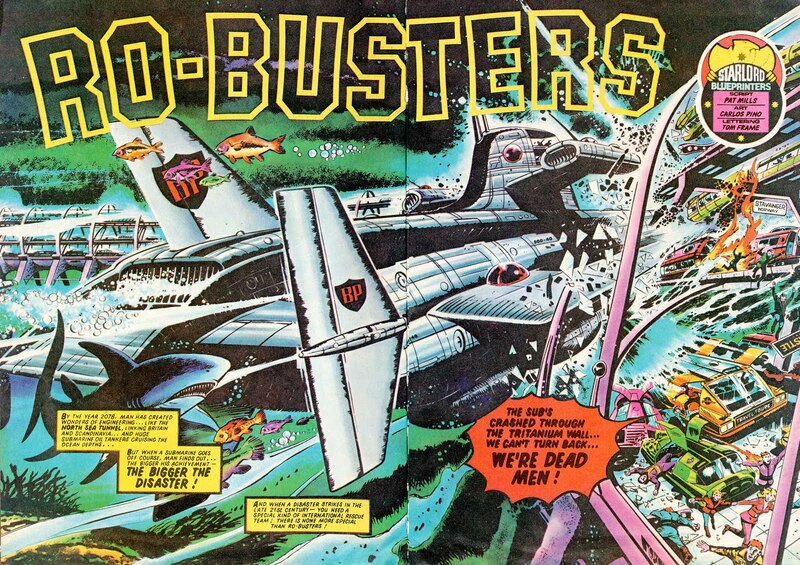 Clint Langley drew my attention to this great blog: The Yellowed Pages, which seems to have the entire Ro-Busters from the Starlord years, alongside many other great comic book stories. The Visible Man and Woman are back in the 2000AD Christmas special! 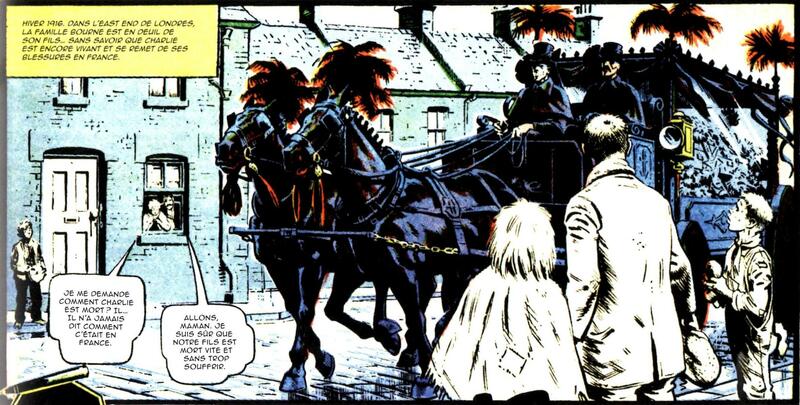 Here’s the second batch of images from Finn: Season of the Witch (By Pat Mills & Tony Skinner, art by Jim Elston), out now in Issue 329 of the Megazine. I hope you like them as much as I do! You can see the first batch of images here. What a pleasure to see this again. Jim’s artwork is really lovely, and I had a good laugh over certain scenes. I’ll post another batch soon! 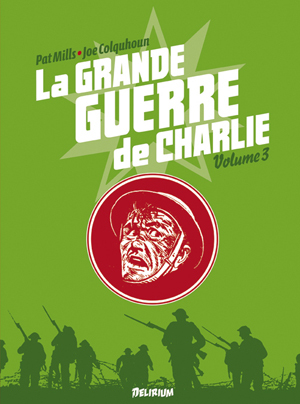 The French edition of Charley’s War Volume 3 will be on sale in French stores on October 15th. It’s astonishing and very gratifying that such a series should sell so well in France. But this latest edition has something extra, never seen in the British editions. Selected pages in colour! They were in a half-tone on the Titan version, but now they can be seen for the first time as they originally appeared in the pages of Battle. Although they were coloured by an in-house artist, and not by Joe Colquhoun, they are generally sympathetic to Joe’s line work. More importantly, now they’re printed on the excellent high quality glossy paper the French are renowned for (Grumble, grumble that the French always have the edge on us! ), the colour pages look a lot better than on the original, good old British bog paper. 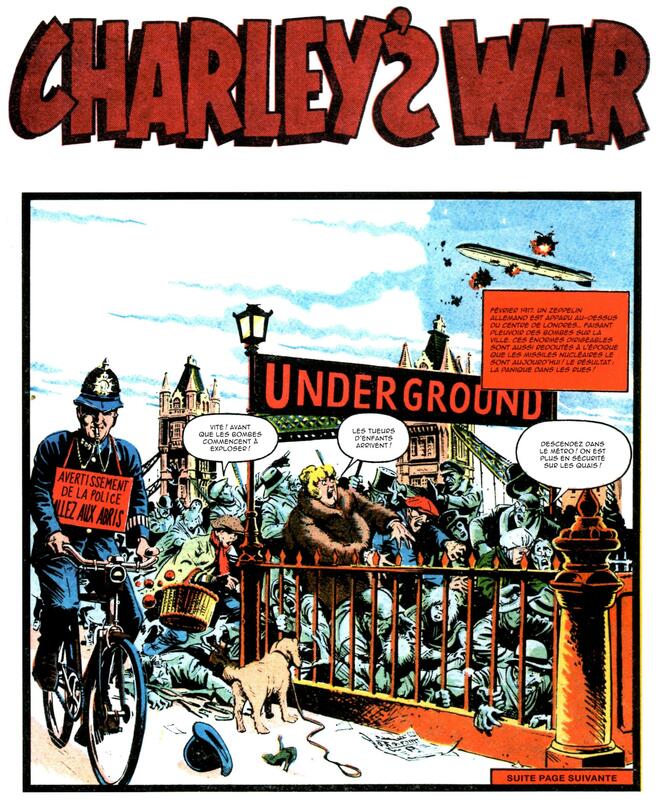 So here is a selection of my favorite pages in colour (apologies for the poor home-scan quality), Including the scene where a British bobby – memorably – has a “Take Cover” sign written on him in French. Does that only seem funny to us Brits? The publisher, Delirium has done a truly excellent job on this version with very careful and thoughtful French interpretations on English words in the art. My thanks and congratulations to them. 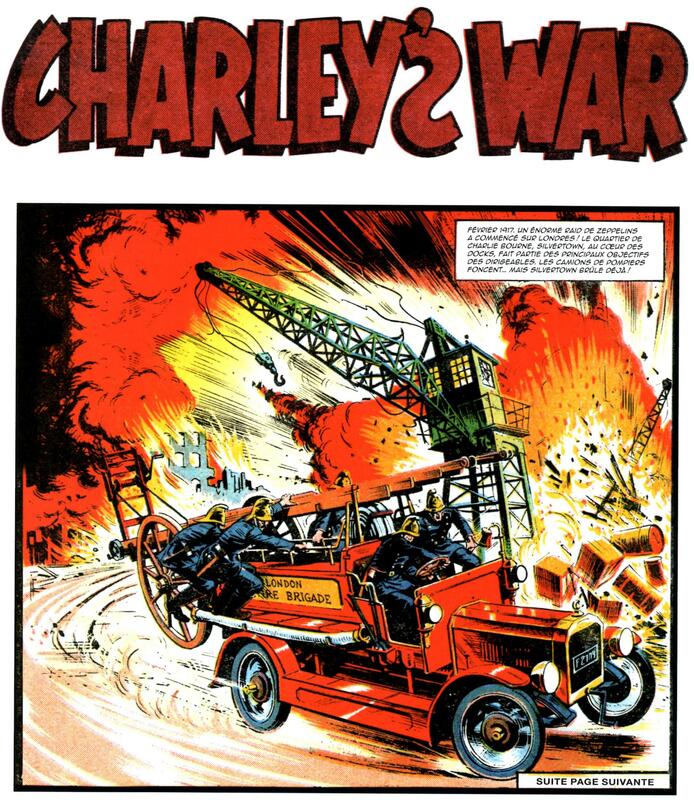 BTW… Later volumes of Titan Book’s editions of Charley’s War are now often shot from Joe’s original pages, so you can really see the beautiful detail in his artwork. This is an edited version of an article I wrote for Spaceship Away – the classic Dan Dare fan magazine – in March 2010, and subsequently published on my Facebook page. 1976. I realize that the science fiction comic I’m creating, 2000AD, needs a space hero. I think about bringing back Dan Dare – the publisher, John Sanders, is agreeable, he tells me not to worry about the original fans and I study the bound Eagle volumes. I’m hugely impressed by the original Venus adventure. I commission writer Ken Armstrong (he wrote Hook Jaw in Action) to write a NASA-style version, with something of the realistic tone of the original. By now it’s clear 2000AD’s paper won’t be web offset, which takes ‘fair’ colour, it will be ‘pulp’ letterpress with rudimentary colour. This could be a real problem for Dan Dare. Ken designs a superb, authentic NASA style-spaceship with lots of projecting bits and pieces, based on modern orbiting spaceships. I commission an Argentine artist to draw it – in black and white. Paul Da Savary has film rights to Dan Dare and shows me his fantastic artwork for a movie and also a retro TV series featuring the Treens. His producer, who has worked on Space 1999, thinks our spaceship would not make good merchandising because of all the projecting solar panels. I formed the impression they weren’t keen on us reviving Dan Dare. 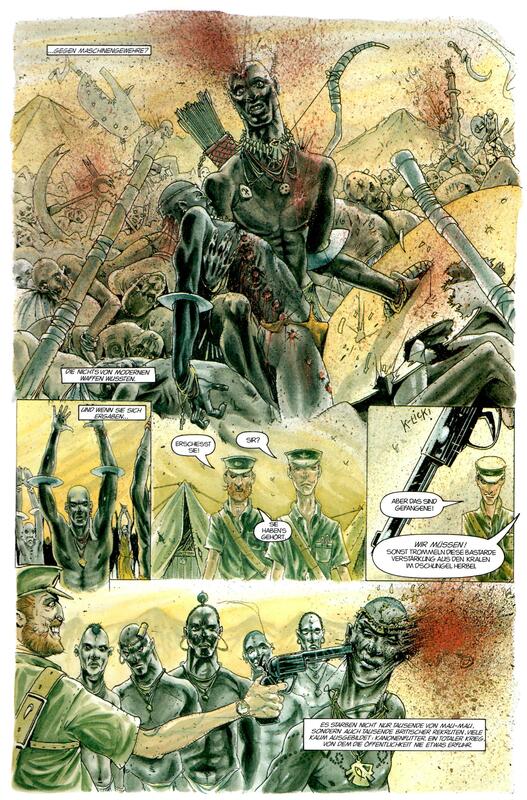 My publisher tells me that Da Savary might buy 2000AD as an outside contractor to IPC Magazines. 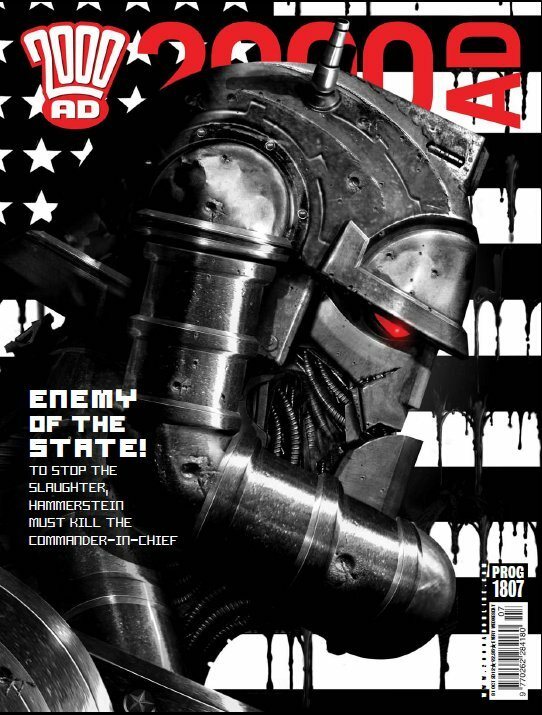 Me and John Wagner (Judge Dredd) will be creative partners in the enterprise and thus receive a share of the cover price. 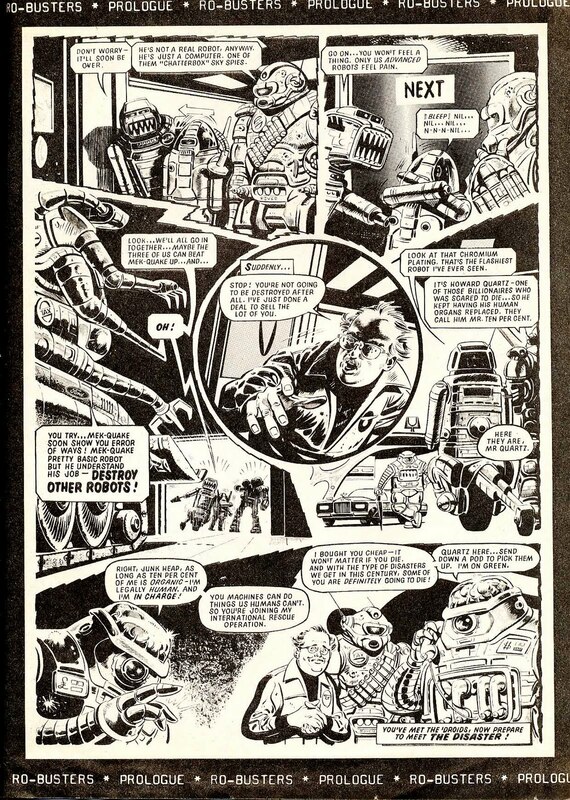 John Wagner creates Dredd with this in mind. IPC board of directors then say no, John Wagner withdraws from the project and Dredd, and I create 2000AD for a fixed fee as a freelance. 1977. The Argentine version of Dan Dare is very good – but only from a purist pov. (No visuals available, I’m afraid) It was in a semi- Sidney Jordan style with a cool inking style. I know SF fans will like it then (and now) – but I also know that it won’t appeal to the mass audience I’m aiming for. The artist’s figures are small, under-characterised, and his storytelling is hard work. Given that the story was also a realistic slow burn, I just know it won’t appeal to kids. I decide to dump it. Awed by the Da Savary version, I decide to write a new, less NASA and more compelling version myself with my editor designate Kelvin Gosnell. Kelvin and I write an exploration of Jupiter’s red spot with astronauts wearing anti-grav suits and alien life forms based on microscopic life in the National Geographic. Story-wise I think its basic plot is valid in Dare terms. We try out one or two artists – I believe two Italian brothers, one of whom drew Death Game 1999 for Action – but their version looks dull to me and I turn them down. I want Dan Dare to be special. Artist Bellardinelli submits a wild version on spec. At least it’s exciting and eye-catching and – most important – helps us over the poor quality paper. A ‘TV21’ look won’t work on bog paper. Bellardinelli’s black line is the best in the business. I know his work from the past on Battle and Action and there his figure work is not bad. 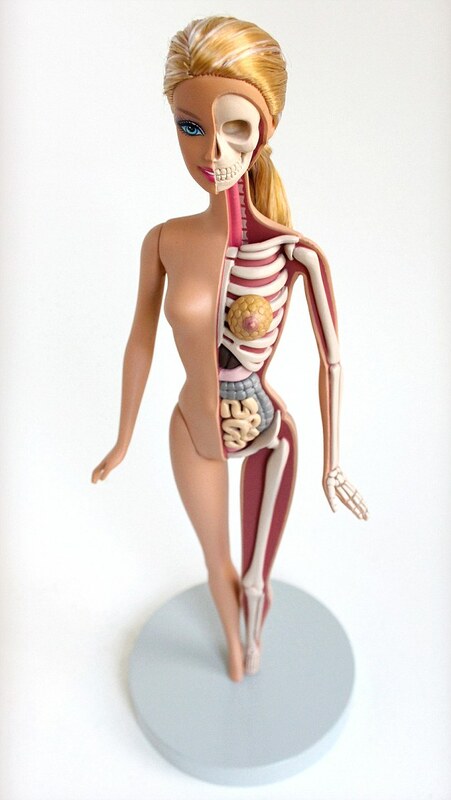 Distinctive but not weak anatomy. But on Dare his weak anatomy increasingly starts to show. This would get worse throughout his subsequent career (on Slaine etc) because of his origins as an excellent inker, not penciller. The basic character design is also wrong – an over-reaction against the old Dan images. Kevin O’Neill, my art editor, points this out to me and I arrange a straw poll to see what everyone in IPC juveniles think: some thirty or more people. If they agree with Kevin, I’m still prepared to dump it – even at this horribly late date. But my straw poll (I was told by my pollster) really liked it apart from the managing editor who thought it was a bit “fantasmagoric”. It’s now two weeks to press date and encouraged by the straw poll, I decide to go for it. 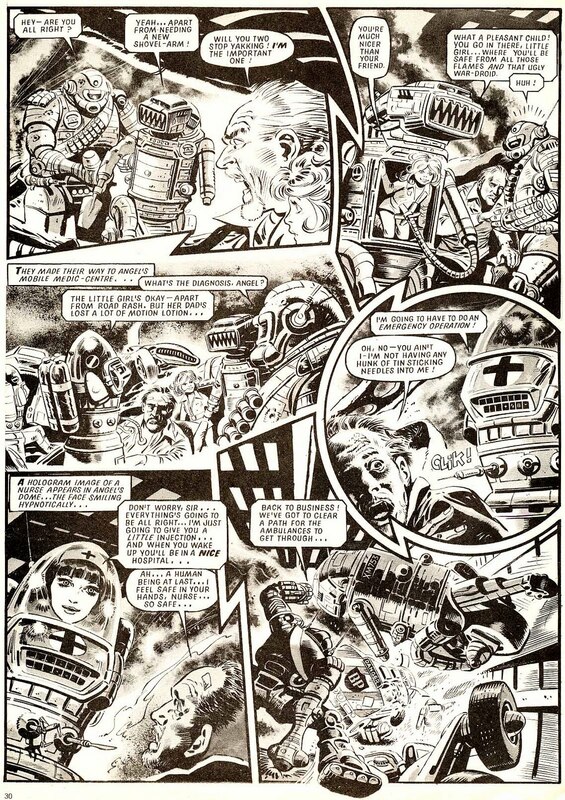 2000AD appears, it’s a success and Dan Dare is popular – about 3rd or 4th in the popularity charts. Certainly not at the bottom in a comic where the readers liked all the stories. I don’t recall any critical letters apart from things along the lines of “my dad doesn’t like it, but I do”. And sometimes, “my dad likes it, too.” Lot of criticism in the press, however, but we don’t care about annoying them. In fact we quite like it. The first Dan Dare story concludes some 10 or 12 weeks later. By now, I’ve realized that the readers appreciate really wild SF which – most importantly – compensates for our poor quality paper. 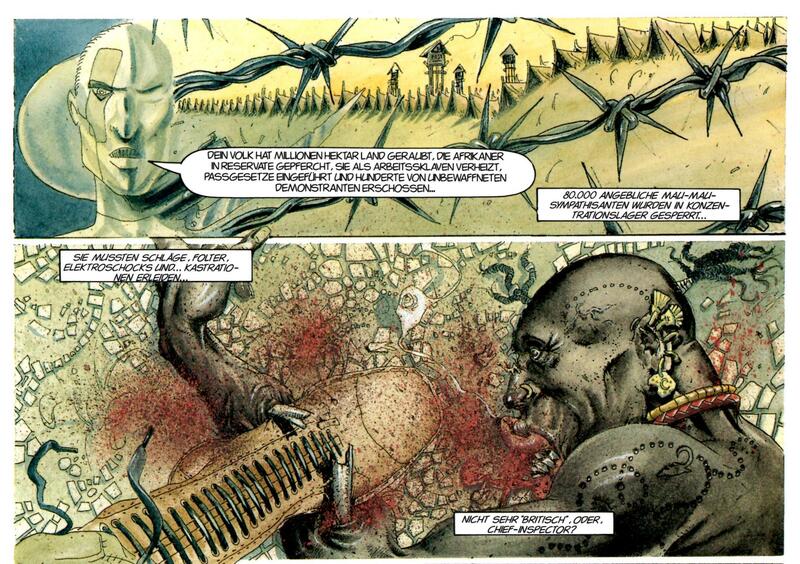 So I want the second story to be even visually wilder and this was written by Steve Moore. There was a great vertical opening spread showing Dan Dare arriving at a London teleport station. After I leave, I hear Tom Tully has taken it over and given him a power hand and a superheroish costume. Neither of these moves would meet with my approval, but it’s no longer my gig. I’m aware there are subsequent attempts to get it right, but of course the more you change writers, artists and realities, the more you can lose the readers’ interest and I believe that’s how Dan Dare eventually died in 2000AD. Perhaps a year or so later (I don’t recall exactly) I hear from Tony Dalton, a film critic connected with the BFI, who tells me he now has the Dare film rights and would John Wagner and I like to do a film treatment of the character? He has studio interest already. With Star Wars so popular, we agree. 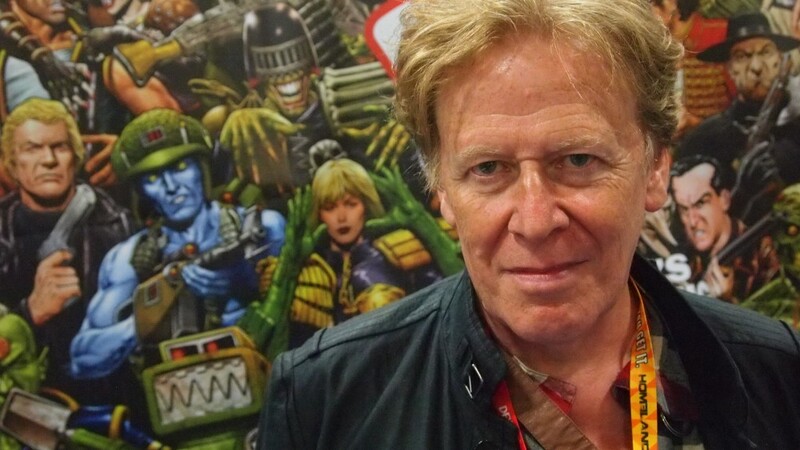 We meet Gareth Hunt billed to play Dan Dare and also a great fantasy artist from the Young Artists group who has drawn some fantastic scenes. The brief clearly has to be Star Wars and we come up with a strong storyline (on spec). We hear nothing more, months pass, and then we learn that Eagle is being revived with photostrip. 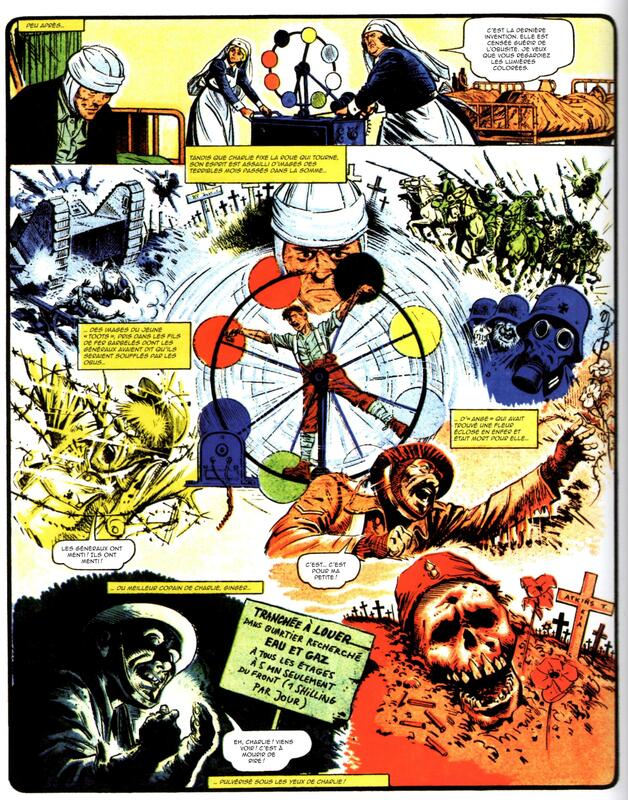 But Dan Dare is to feature in a colour, fully painted strip by Gerry Embleton. Would John and I like to write it? Of course we do, it’s a way of using our detailed film treatment. Only there’s a catch. Dan now has to be the original Dan’s great grandson (!!) and there’s some story about him going through a time warp as a fighter pilot in the Battle of Britain. This is to tie in with a film version and we understand this is connected with Da Savary who now has the rights again. Loaded down with this awkward extra, we make the best of it and the story is number one. Readers like our sf ideas – such as aliens with flying sharks on leads. Very Star Wars. But Embleton eventually leaves, Ian Kennedy takes over, John Wagner drops out and I’m left ‘holding the baby’. 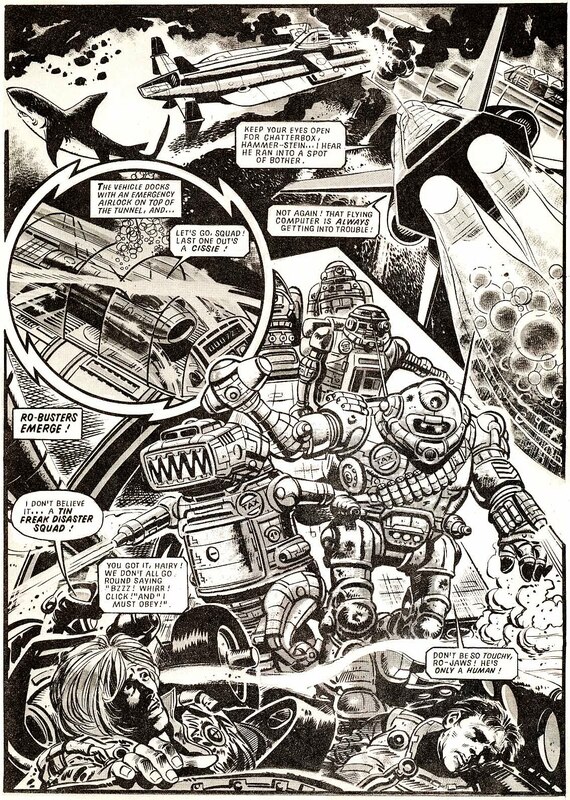 By now, I’m so appalled by the numerous changes to Dan, both on 2000AD and Eagle, I think – no matter how difficult – I have to ‘get it right’. I begin by doing a grounded NASA style version which, because it’s Ian, looks pretty good and stands up well today. I write man’s first trip to the stars with authentic detail and some critical aspects based on The Right Stuff by Tom Wolfe which covered the appalling treatment of Ham, the chimpanzee. Ham 2 features in my story. The story works and now I decide I need to get it back to as close to the original as is viable. I’ve made contact with a young astronomer and science fiction model maker Julian Baum based at Liverpool observatory. He has produced some excellent planetary photographic landscapes and models which were integrated into the strip, in the tradition of the original classic series. But as the story moved back towards science fiction I couldn’t see how to use his great talents further. While Dan had been away on his first star mission, the Treens had invaded Earth and the Grand Canyon was the rebel redoubt (useful for star fighter Death Star-style scenes). The head of the United Nations Space Force was British and everything was as close as I could get it to the original, despite the grandson tag. I also wanted Dan to have a credible back story, so I looked back at the original classic series. I think it’s a legitimate device to rationalise earlier notions with modern science, so I found NASA maps of the Venus continents under the cloud cover and used those as the basis for the classic continents of the Therons and the Treens. Heavy industrialisation by the Treens had caused a runaway Greenhouse effect which explained the hellish atmosphere of the fire belt. 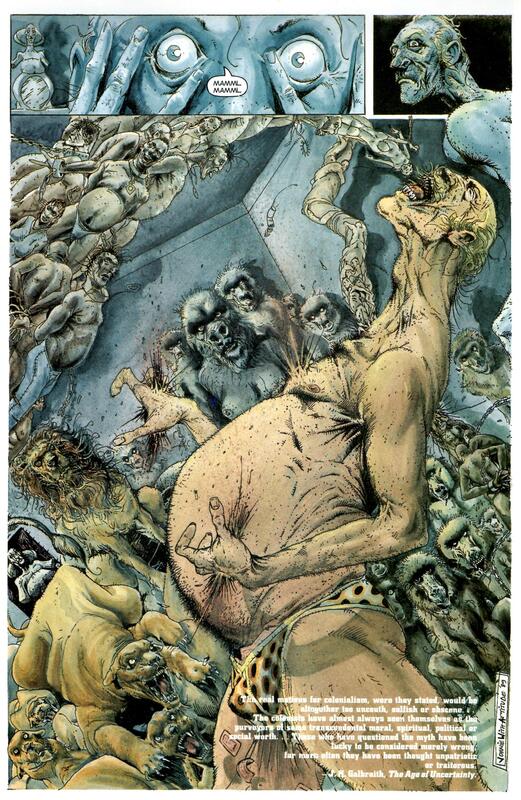 Increasingly I was drawing on the past, not least because I was becoming more fascinated with Frank Hampson’s original. Whereas later classic stories by other original associates of Hampson are sometimes somewhat dated in either story, art or character, I loved the vibrant energy of Hampson’s original. 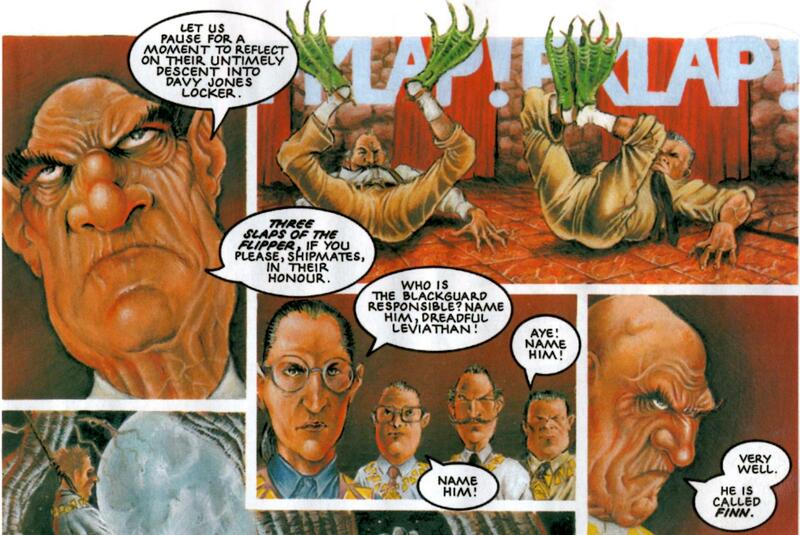 So I worked some flashback scenes in with tremendous help from Dan Dare fan Alan Vince who sent me relevant images. I also tried writing the story in the minimalist style of the first Eagle adventure with its floating headshots. Dan and co. were victorious at the battle of the Grand Canyon and I now had to consider whether I should continue. 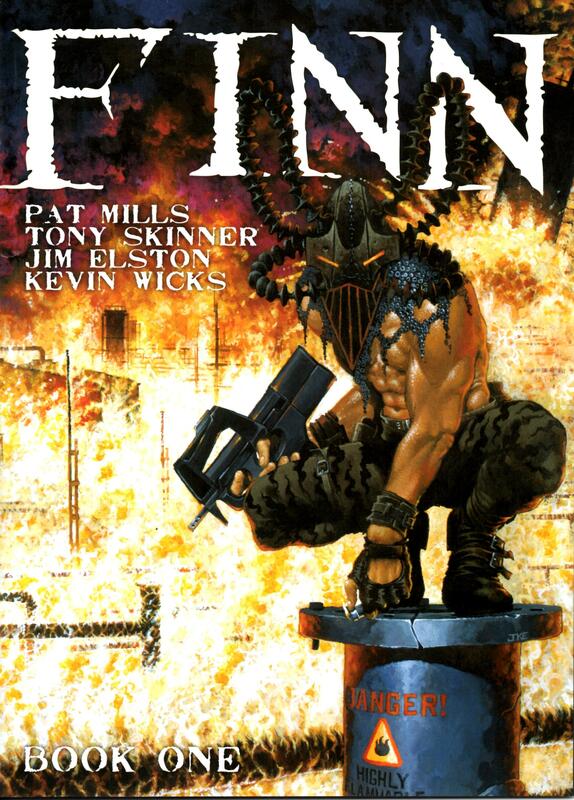 The story was still number one in the comic, but I felt I’d done my penance for reviving the character. Unless I could make it even closer to the original, there was no point in going on. This was not possible and I walked away from it. I believe Tom Tully took it over. 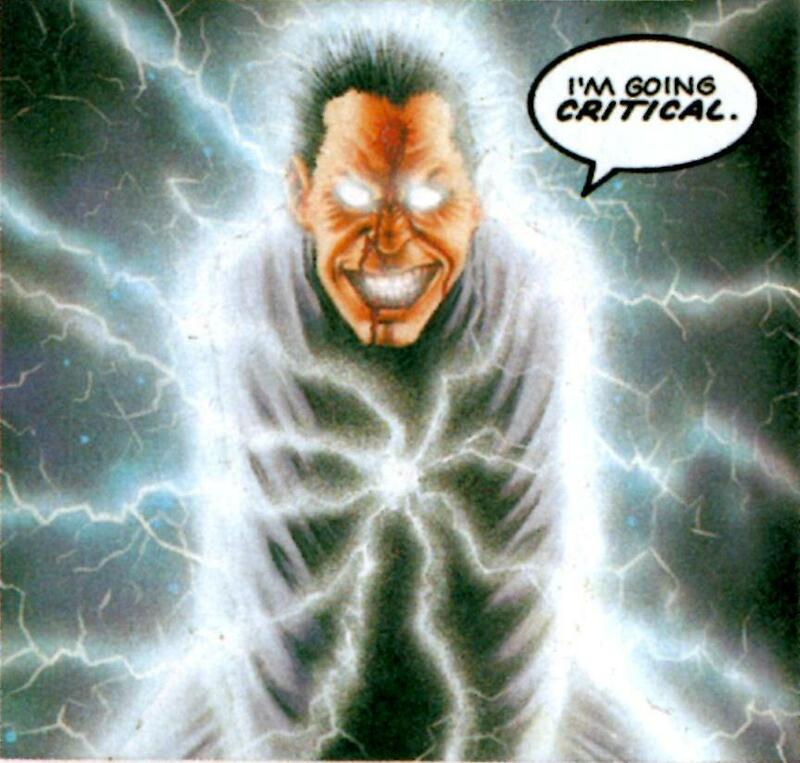 Subsequently there have been versions of Dan Dare by Grant Morrison and also Garth Ennis. No doubt there are others in the works. Moral of the story? Stick to the original vision of the creator. Reinvent or re-imagine at your peril!